House builds can be daunting when you have a project manager down the road in the same time zone as you who knows you better than the back of his own hand, and where you know the local rules of the land. Considering building a property in Spain can strike fear in to your heart. However, it needn't be daunting when you choose Z Sanchez to build a property in Denia. We focus on making the process as simple and hassle-free as possible so that you don't get stuck in a tangle of Spanish bureaucracy which blows your budget and your mind. How we do this is unique. At Z Sanchez each and every property in Denia which we build is important to us. At the heart of this approach is that each and every client we work for is valued and important too. We don't believe in a one-size-fits-all approach. We do believe in listening to your expectations and desires whilst also allowing you to benefit from our expertise, experience and local knowledge. This tandem approach of combining your dreams for a home in the sun with our knowledge, experience and reputation means that your property in Denia exceeds your expectations. What's more, it goes on to represent an excellent investment for the future too. This starts with enabling you to understand the process of house buying in Denia. House Buying in Spain – How Does it Work? With Z Sanchez this means that you are able to view the actual property and know it is within a high quality development. This is an easy and straight-forward option if you want a home in Denia fast. However, it doesn't allow for the same bespoke service a new build does. We are happy to build to your plans on exceptional plots in the Denia region. Our local Spanish builders are exactly who you need on the job. By choosing to use us for the entire process from plot selection to design and building you don't have to compromise. You can use our architect to design bespoke plans for you, or choose from our range of popular designs. We consider it a vital part of our service to help you deal with all of the planning and local permissions you need when building a property in Spain. For this reason we also work closely with local lawyers as well as offering long term flexible management services. Our reputation speaks for itself, but we hold ourselves to rigorously high standards. All Z Sanchez properties come with a 10-year guarantee against structural defect through the Alicante School of Architects. 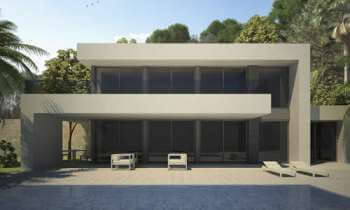 This is why the Ibiza design of home by Z Sanchez is proving to be a real favourite. This elegantly modern style invites relaxation with smooth lines and a luxuriously contemporary feel. Light play both within the home and the terrace and pool area is fabulous. You can find out more about our build styles here. 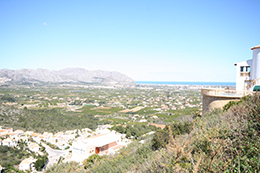 Plot Selection: Throughout the Denia region, within the town, close to the beach, on the surrounding hills, we have a range of locations for you to choose from. You can choose from within a select development or an individual plot. Property Selection: Once you've honed in on the location, you can choose whether to choose a design from the Z Sanchez styles, such as the Ibiza, or have our architects create something new for you. Alternatively, we can work to your own architectural plans. Quotation: We strive to ensure you receive a clear transparent quotation which also states guaranteed completion dates. 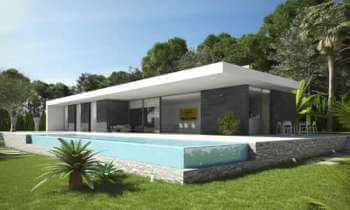 We work to continually reduce the anxiety that building a property in Spain can bring. The First Steps: Only when you are completely happy will you pay your deposit which will reserve your plot. Alongside this, your Spanish lawyer will conduct searches similar to the conveyancing process in the UK. A schedule of construction payments will be agreed with you and your lawyer. This will then enable you to securely complete the purchase of the plot. Construction Begins: Your build in Denia will be broken down in to clear stages. On completion of each stage, as verified by the Alicante School of Architects, you make construction stage payments. Construction Completes: On completion, the build is again verified by the Alicante School of Architects. The deeds are signed and you receive all of the necessary documentation, including your 10 year guarantee. Your dream life in the sun begins: You now have a luxurious home of your own in Denia. We recommend budgeting 10% of your purchase price for these third-party costs. The Gov.uk site offers some information for Brits who are looking to buy in Spain and you can find their resources here. This was written after the 2008 Spanish credit crash, so offers reassuring up-to-date information.